Like at least one member of the "Ending B" squad, I too am looking forward to the release of the new Harvest Moon games. In addition to the DS version, I'm looking forward to the Wii version as well. I can't wait to do chores with my Wiimote! While waiting for the new Harvest Moon games, I decided to do a quick retrospective of the Harvest Moon games I've played, mostly concentrating on one of my favorite aspects, the dating scene! Why is that my favorite?... I really don't know, but here we go anyway! Harvest Moon (Original), Ann: Though the SNES was the first in the series, it wasn't the first one that I played. Since it's first in the series, however, I shall start here. Ann turned out to be the most interesting to me because she was the ONLY girl in the game who was NOT girlie (which is odd because I usually like the girlie-girls). Not only that, but she was the only one who seemed to have an interesting hobby, inventing! 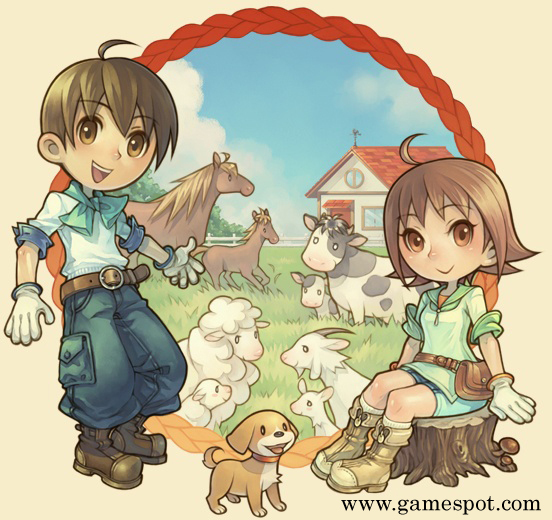 Harvest Moon: Save the Homeland, Dia: Dia was fun, as the shy quiet daughter of a rich family. I actually don't know much about her, because I stopped playing once I found out there was no dating aspect to this game. I did make friends with her before that realization, and she seemed nice (at least). Harvest Moon DS, Muffy: Muffy is the barmaid of the village, and is fairly shallow when it comes to presents (jewelry, wine, other expensive things). Despite that, she's a sweetheart, and that's what really counts. She doesn't like to cook, but she'll cook only for you if you marry her (awww, that's kinda nice). Harvest Moon: Magical Melody, Gina: There were a few important choices I had to make when courting in this game. Some girls needed to be unlocked/move into town, and each person in the game makes a short noise when you talk to them. I decided that I wanted to "marry" a girl who wasn't a native to the town and who's talking noise was tolerable. Gina fit that bill perfectly. She moves in as a registered nurse and gives a soft chuckle when you talk to her. Plus, she loves Coral, making her VERY easy to impress.